It’s easier to sell to an existing customer than a new one. Studies show that it costs up to 10 times more to acquire a new customer than to keep an existing one. Has it been a while since you communicated with your past customers? The ReConnect Program is a highly personalized customer retention and lead generation program. It’s designed to generate leads and referrals while cross-selling to customers you haven’t been in touch with for at least 6 months. 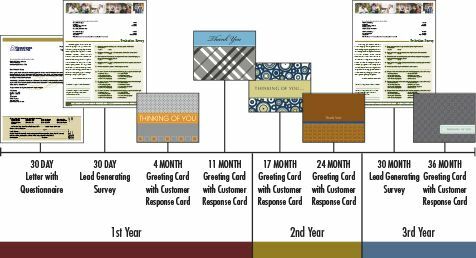 Generate leads by reintroducing yourself to your past customers through direct mail programs. The ReConnect Program marketing technology is flexible to your company’s needs. Standard past customer marketing programs are available in 1 to 3 year schedules. Need a custom solution for your company? To inquire about an enterprise account, please call 800-521-0026.